Darjeeling district is home to mainly immigrants from Nepal, Sikkim, Tibet, Bhutan and even Europe. In 1835 when the British took over Darjeeling after signing a deed with the Chogyal (King) of Sikkim, it was a deserted place full of dense forests and having only handful of tribal inhabitants. The British originally explored and developed Darjeeling to set up a sanatorium or a health resort for the ailing British troops. The European civilians in the plains also considered the climatic conditions suitable for their settlement away from the dust and heat. The vast expanses of potential tea estates also triggered their interest in the tea-industry. As the British started settling down in the district of Darjeeling, many took keen interest in building English medium public schools several of which are now well known educational institutes. The European settlement later went on to attract many international agencies for mountaineering expeditions as well. The British encouraged immigrant workers for the development of the place for cultivation, tea plantations, construction of roads & buildings. As a result the immigrant population started growing rapidly in Darjeeling. In about 10 years between 1839 and 1849, number of immigrants grew from 100 to 10,000. While immigration to Darjeeling took place from all neighboring places, most came in from Nepal. The district of Darjeeling spans across an area of about 2092 square km. The hill town of Darjeeling is only 10.5 square km in area. The population of Darjeeling district according to 2011 Census was 1,846,823. Although Darjeeling hill town and its water supply was originally designed only for a population of 10,000 residents, the current population has grown to about 1.4 lakhs. The town of Darjeeling, Kurseong, Kalimpong and Mirik have had a major influx of Nepalis. The Terai region which is commonly known as the foothills of the Himalayas, includes Siliguri subdivision and is mostly inhabited by the Bengalis. 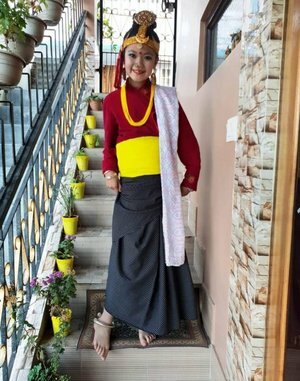 As you look at the mix of the people and their origin, expectedly the languages spoken in Darjeeling include Nepali, Hindi, Bengali and English, while the refugee from Tibet speak Tibetan Language. However almost all can speak Hindi. The Lepchas are the original inhabitants from the time when much of the land was covered with heavy forest. They are of Mongolian origin and speak in a language of their own called 'Rong-Ring'. The Lepchas are also known as Rongpas. They identify themselves with mother nature and thus the name 'Mutanchi Rongkup' - Mother's loved Ones. They are usually Buddhists by religion but many have adopted Christianity. The women Lepchas dress gracefully with colorful beads and have a serene look. Socially they follow tribal culture rearing cattle, goats and pigs. They concentrate in cultivation of crops like maize, wheat, rice and cardamom. By and large the Lepchas are mainly known for being a tolerant and peaceful tribe who hated aggression. They are also known for making excellent bamboo craft. Most of the information about this tribe are now available only through traditional folklore. The Khampas who belonged to the Lepcha tribe are relatively recent immigrants from Tibet. They are Buddhists and dress like American cowboys. They are warrior group as opposed to the original Lepchas who are usually docile. The immigrants from Nepal, known as Nepalese, speak Nepali language and their religion is usually Hinduism (although some communities like Tamangs and Sherpas also follow Buddhism). They comprise of a number of clans speaking different dialects. Among them are the Upadhyayas, the Thakurs, the Ranas, the Brahmins, Gurungs, Tamangs, Rais, Magars, Thapas and Newars. One of the ethnic groups of the Nepalese is the Gorkhas. Gorkhas contribute to the greater bulk of the hill people. They are popularly known as the 'martial race' as many of them found place in the Indian Army. The Gorkhas are identified by the possession of the traditional weapon 'Khukri' - a curved, decorated knife. A part of the Gorkha regiment was also transferred to the British Army. They served the British Army with extreme loyalty and won a number of awards including the 'Victoria Cross'. The Tibetans wanted to be independent from China, so many refugees have come to India from Tibet and settled in Darjeeling district since 1950. Their 13th religious leader, Dalai Lama was in exile in India from 1910 to 1912. The Tibetan people are Buddhists and have their own Tibetan language. The Tibetan women are specially known to churn yak's milk into butter and it is served mixed with tea and barley flour. For rehabilitation of the Tibetan refugees, the Tibetan Refugee Self Help Centre was established in1959 at Lebong in Darjeeling town. 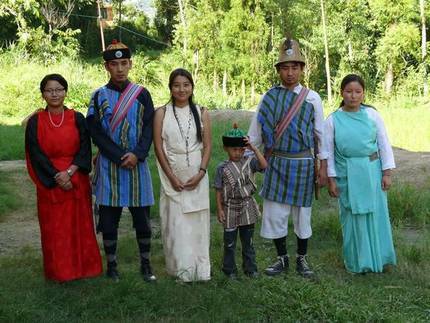 Over the years, many Tibetans in Darjeeling have prospered and established themselves. Several of them own nice hotels offering traditional Tibetan charm and hospitality. The story of the people of Darjeeling will remain incomplete without mentioning the Sherpas. This ethnic group from this region of the world's highest mountain derived their name from the Tibetan word 'shar' meaning 'east' and 'pa' meaning people. They are well adapted to the high altitude, the steep rocky terrain and snow. Even today with the advancement of science and technology no one from any part of the world would dare to explore the Himalayan mountains without a Sherpa guide. Mount Everest, the highest peak of the world was conquered for the first time by the Sherpa Tenzing Norgay together with the New Zealander Sir Edmund Hilary in 1953. Some Sherpas follow a traditional way of life growing potatoes, radishes, barley and buck wheat. More than 90% of the Sherpas follow the Buddhist faith and minority of them are Hindus and Christians. As Darjeeling district became a part of West Bengal during the British rule, a number of Bengali families settled in Siliguri, the terai region of the Himalayas. The Bengalees are a romantic, emotional lot who attach great reservations and sentiment with this district. They have contributed a great deal to expand the economy of this region by getting involved in various trading activities. Several Bengalees once owned tea estates in Darjeeling. They also form a major portion of the tourist community of the hill towns of Darjeeling. The Bengalees speak their own language Bengali. Others residing in the plains are the adivasis (or tribes) from Chotanagpur and the tribe 'Santhals'. Although Darjeeling district harbors a variety of people who have their own distinctive languages, cultures, origins and ways of life, they are all nevertheless very hospitable and extend a lot of warmth. The official language of this district is Nepali while the official state language (of West Bengal) is Bengali. More than 50% of the people speak Nepali. Almost all understand and speak Hindi as well. Another great attraction of Darjeeling is its varieties of local ethnic foods. Due to diverse origins and culture of the people, you will get authentic original local food from various ethnic groups.... like Tibetan, Nepali, Bengali etc. Who doesn't know about the world famous aromatic Darjeeling tea. But there are local hand made snacks like Churpee (made out of Yak's milk) or drinks like Tongba (a local beer) that you may not have ever tasted before. Visit Darjeeling Ethnic Food & Drinks to know about all such exotic food and drinks that you can get in Darjeeling in their authentic form. Various mix of cultures have created unique and different types of art and craft works in Darjeeling which reflect not only their traditions and customs, but also their respective religious faiths. Thankas for example are the scroll paints usually on silk reflecting Buddhist religious stories. Khukris are the curved decorated knives that reflect the pride and power of the Gorkhas. And you will get various types of curios, trinkets, handmade jewelry, bags, woolens, traditional masks and lot more made with deft artistic skills rarely seen anywhere else. Visit Darjeeling Art & Craft for full information. Dear Raj Saab, Unfortunately my younger one met with an accident at Toy train station and all the people, railway staff including the station master himself rushed to help us. Luckily my child was safe and was treated immediately at nearby government hospital. The Station Master made a couple of calls to me to inquire about health of my child. and also offered us a free ride the next day (since we could not ride the previous day due to accident). The entire station staff came to talk to us and see my child the next day. They were happy to know that my child was safe. I am sharing this experience on this website just to let you know that people here are very helpful and good. We had a great time here. we appreciate your good work here. A BIG THANK YOU, Raj sir.